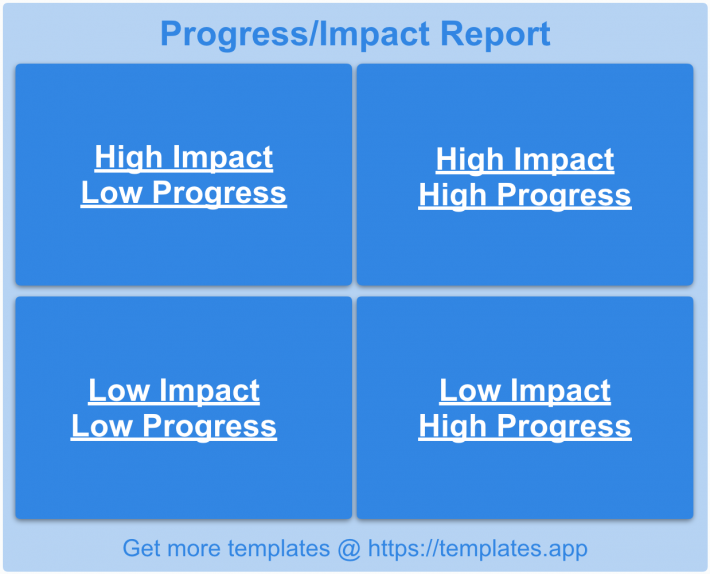 The Progress/Impact Report helps you take stock of how far along everything is and which projects will have the most impact on success. Visualizing this will help you decide which projects’ progress should continue or be accelerated and which is less critical. This template helps you visualize the results of different prioritization choices you may make. In Quadrant One, all projects that have high impact but so far have not progressed as far as they should. Too many projects here should cause indicate that priorities should be shifted. In Quadrant Two, all projects have high impact and are progressing as they should. It is optimal if the greatest number of project are in this quadrant. Projects in this quadrant should continue to be monitored and actively focused on. In Quadrant Three, all projects that have low impact and are not as far along as they should be if they were high impact. You should seriously consider pausing all projects in this quadrant. In Quadrant Four, all projects that are low impact but progressing very well. Considering how well these projects are going, it may be a good idea to close these as soon as possible. However, closing these projects should never get in the way of any work on projects in quadrant one or two.